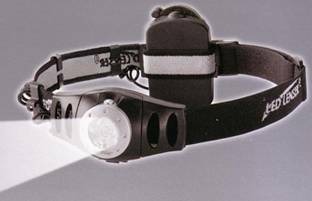 Headlights are led lights that can be worn on your head using adjustable bands. The advantage of a headlight over a flashlight or lantern is that it leaves you hands free for carrying other items and the light is always shining in the direction you are looking. Originally headlights were used for camping and have been available here in Canada within the last 5 years. Recently however headlights have become more popular and are being used in more applications then just for seeing your way through the woods at night. I’ve taken 3 brands of headlights to see if one headlight is better then the other. This headlight has 3 LED lights and is able to change it’s angle direction 180 degrees. The band is a simple nylon stretch band that is adjustable and fits comfortably around your head. The light has an on/off switch and it is detachable from the head band if you need to put the light down to light and area such as a tent. This headlight has only one LED light, but is extremely bright when at full power. The angle direction has three distinct positions, straight ahead, 20 degrees down, and 45 degrees down. The band is a single nylon stretch band that sits comfortably around your head. There is one on/off switch and, as you can see from the picture, there is a pack at the back of the head band. This pack is a dimmer switch that allows you to set the brightness to your preference given your situation. Many times I have had a headlight on looking for something in the dark and then I turn to speak to someone and blind them with the intense LED light directed right in their face. This dimmer switch allows me to adjust that strength of the light and avoid that situation. This is the Tikka Plus model. It has four LEDs and is brighter then the Dorcy light, but not as bright LED Lenser at it’s most powerful. The light tends to give off a blue-ish hue as compared to the intense white of the other two headlights. The Petzl light has a starting angle direction of 15 degrees down and has 5 distinct positions that angle downwards at 5 degrees each. There is one on/off switch, but if you press the button more then once quickly you will find that the light dims on the second press of the button, dims again on the third press, and then flashes brightly on the fourth press. The advantage of the flash is that it can be used as a warning light while jogging or biking at night when worn on the back of your head. 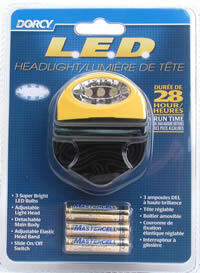 This light can also be detached from the head band and the LED lights can be replaced. I think the Petzl LED headlight is the best of the three. It has all the functionality of the other two brands as well has having the flashing function. The blue-ish hue provides the same brightness as the other white lights, but isn’t as harsh on the eyes if you find yourself “caught in the headlights”. With the multi touch dimming button you are able to set the light intensity without having to wear a large dimmer pack on the back of your head like the LED Lenser.